Many electric transformers along the busy Wapda Road in Siddhirganj of Narayanganj pose risk of accidents as they have been installed much below the normal height. During a recent visit to the area, it was seen that two transformers were placed only 12 to 15 feet above from the ground. There is no warning sign though the road is frequented by and pickups and trucks —- with almost the same height when overloaded with goods. 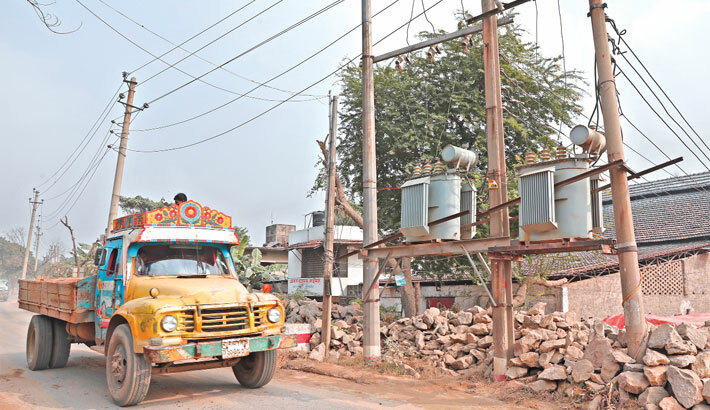 Besides, many makeshift shops were also set up under the roadside transformers in various places across the country, putting public safety at risk. Furthermore, in many parts of the capital, power lines remain in very close proximity of balconies and windows of residential buildings. Transformers are also kept within easy reach of people in several congested localities of the capital, particularly the old town.